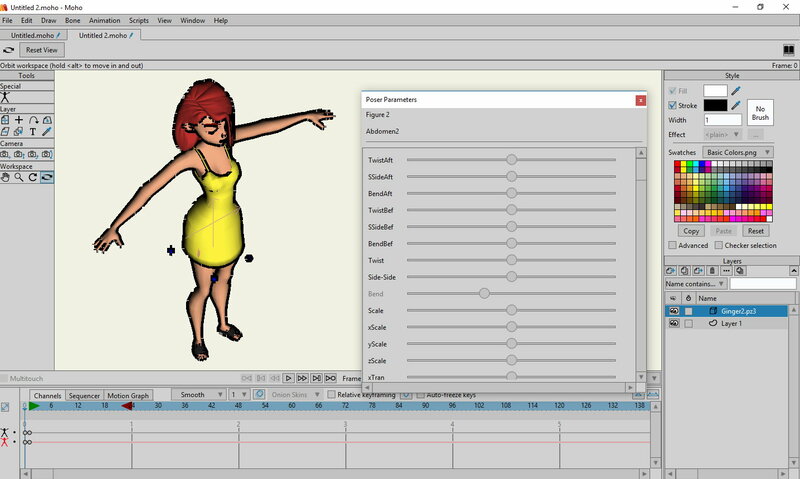 A brief look at 6 more of Moho's Pro Video tutorials in my continuing series following my progress of learning SmithMicro's animation studio. Of most interest here is the ability to create and import 3D objects. To me that's a little beyond the scope of 2D animation software but if you do want to combine 2D characters with 3D environments it is nice that you can achieve that without having to leave the program. 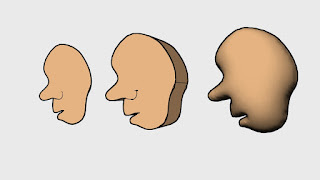 There's also a brief introduction to importing 3D characters from SmithMicro's Poser software. Whilst you can still animate these characters directly in Moho the control method seems very limited (just based on what I've seen thus far). 3D shape design covers the basics of turning flat shapes into 3D objects. In my example on the right I've drawn a simple head shape (left) and then applied the extrude effect (middle) followed by the inflate effect (far right). There is also the lathe effect which creates a 3D object by rotating it through 360 degrees. AS11 Pro Poser shows you how to import 3D objects from other 3D software but specifically focuses on SmithMicro's Poser software (which I recently purchased). The tutorial takes you through the very basics of importing a 3D character from Poser and showing how you can animate the character within Moho. manipulating it's movement with the Poser Tool. The Advanced Camera Tools tutorial is a quick run through of the four tools, Track, Zoom, Roll and Pan/Tilt and how to use them. Nothing actually too advanced here. In fact I feel like they may have even been explained before in an earlier tutorial. The Depth of Field Tutorial is interesting for those of you that like the effect of focusing on one things then pulling focus on something else and making the first thing go out of focus. This tutorial simply explains how the tool works visually and with the numerical settings. I'm assuming, like everything else you can key frame the depth of field to create the pulling focus from one object to another effect. 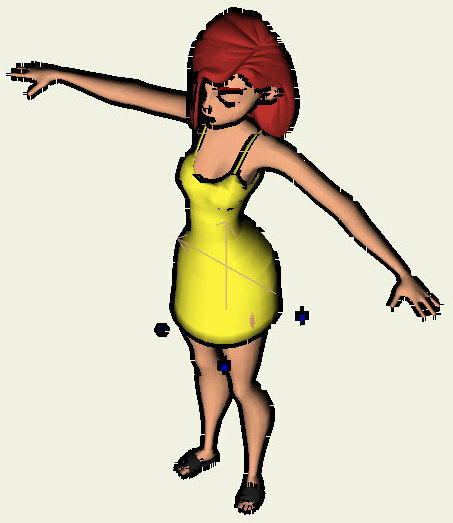 The Depth Shifting tutorial is a little hard to explain but essentially it's being able to move your characters and background elements along the z axis without having them scale as they move closer or further away. Useful if you've already set up a composition and then realized something in the scene is positioned visually correct but is at the incorrect spot in relation to everything else on the z axis. The Advanced Timeline tutorial is a lengthy tour of the main timeline editing features including the Channels, Sequencer and Motion Graph Tabs. Some of the highlights include the demonstration of how Onion Skinning can be used to look at previous and next frames as you animate, key frame options and how to use the sequencer to line up or move items you've set up without having to move individual key frames. If you're still following my progress at this stage, I really admire your commitment. Even though I've said it's getting a little much for me, I feel I have to just stick with it and see all these tutorials through. 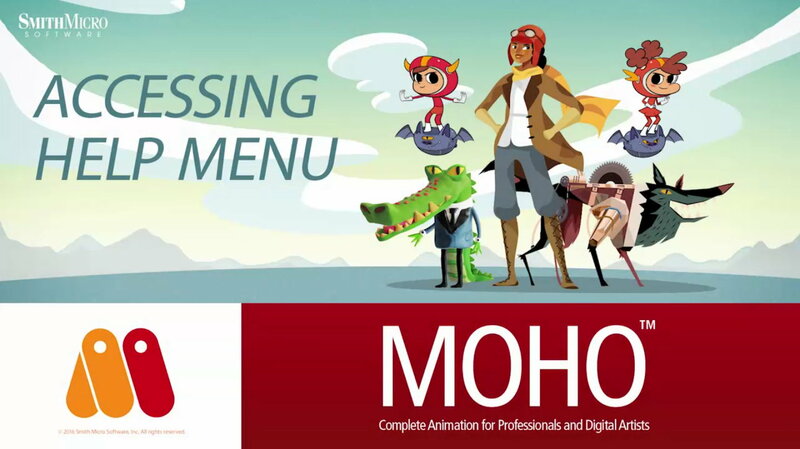 Maybe by the end I'll plan a project using Moho exclusively and blog you through my process of creating that. Assuming I remember enough to do so by then! Continue on to the next post. Very informative.This looks like a cool program. I think I am a CTA3 guy though. I can only learn one program at a time. Learning Moho, Toon Boom Harmony and getting to grips with CTA3 gave me headaches.